You can see how many more Scandinavian crime novels are published than French and Italian because I do a list a year, rather than for a range of years. For the first time in 28 years, Tom Baker is returning to his role as the Fourth Doctor in a series of five thrilling audio adventures from BBC Audiobooks. Doctor Who: Hornets’ Nest is written by the acclaimed Paul Magrs and stars Tom alongside a cast including Richard Franklin as Mike Yates, Susan Jameson as Mrs Wibbsey and Rula Lenska as the Hornet Queen. The brand new series sees the Doctor on fighting form as he comes up against an enemy of unimaginable power and horrific intent. The nightmare is only just beginning… With Tom Baker as the Doctor, Richard Franklin as Mike Yates, Susan Jameson as Mrs Wibbsey and Daniel Hill as Percy Noggins, The Stuff of Nightmares is the first of five linked stories written by the acclaimed Paul Magrs. Listen to a sample of The Stuff of Nightmares at the BBC Shop website. Synopses of all the episodes can be found on the Hornets' Nest website. A new trailer for The Waters of Mars is now on the BBC website. A very wobbly recording of the teaser trailer for The End of Time (Christmas Special 2009) shown at Comic Con is now on YouTube. It's the last week to enter the competition to win a copy of My Last Confession by Helen Fitzgerald (open to all). Mike Ripley reviews Stuart Neville's 'Northern Ireland noir' debut The Twelve stating that it is a "frighteningly assured first novel"
and Geoff Jones reviews the first in the Bella Wallis series, The Widow's Secret by Brian Thompson, set in the 19th Century. Our woman in Harrogate (crimeficreader) reports that the programme chair for 2011 will be Dreda Say Mitchell. Also, the quiz team she was in came third. Congratulations! Sam Worthington will star in Summit Entertainment's remake of Danish thriller "The Candidate," with Wyck Godfrey and Marty Bowen producing through their Temple Hill Entertainment banner. Beau Willimon will pen the adaptation, which follows an aspiring lawyer who wakes up in a hotel room with scant memories of the woman he met the night before, only to discover she's dead in the bathroom -- and he's about to be blackmailed for her murder. Episode 4, The Brothers, can be watched via iplayer for a few more days. NB. The first two episodes, which were shown last year, Before the Frost and Mastermind are episodes 1 and 2 in the UK order but 1 and 6 in the Swedish order (according to Wikipedia) or 1 and 7 (according to Inspector-Wallander.org). NB2. I'm informed that Rolf Lassgård who starred in an earlier series, which was based on the nine Wallander books, is the face of Wallander to most Swedes. ...The Troubled Man from Anneli Hoier at the Leonhardt & Hoier literary agency and will publish it in hardback in February 2011. The Troubled Man tells the story of a retired naval officer who disappears during his daily walk in a forest near Stockholm. It is described as a "deeply personal" case for Wallander, because the missing man is the father-in-law of Wallander's daughter Linda. Clues point back to the Cold War, and to right-wing extremist groups, said the publisher. Mankell said: "I really thought that I had written my last novel about Wallander, but then I had this distinct feeling that there was one more story to be told." Our man in Harrogate...twitters that Mark Billingham has won this year's Crime Novel of the Year for Death Message. The list of contenders can be found here. Constable and Robinson has bought the rights to a debut novel by crime fiction author Quentin Bates in a two-book deal. Frozen Assets is the first title in the deal and will be published in 2011. The book is set in Iceland with Sergeant Gunnhildur, a police woman in her thirties as the central character. The novel starts on the eve of the financial collapse of the Icelandic banks. Bates has begun the second book, but it is yet to be titled. Bates said: "I knew plenty about the country I wanted to set the story in but learning about police work is a whole new world for me, having never been nicked for anything more serious than breaking a speed limit." The pilot episode of the No.1 Ladies' Detective Agency will be repeated on BBC4 on Sunday at 7.15pm. The series will also be repeated (though I'm not sure when yet). I borrowed the above image from an interesting interview with the the show's set decorator at designspongeonline. The first book in the new contract, Dead Like You, will be published in June 2010, with the second and third following at yearly intervals. In a separate deal in the US, St Martins Press crime thriller imprint Minotaur has also negotiated a contract for the same three books. James has not been published in the US since Carroll & Graf launched the Roy Grace series in 2005/6. Read the rest of the article at The Bookseller. Read the reviews of the first five books in the Roy Grace series at the Euro Crime website. The deal for Murder at Mansfield Park, by Lynn Shepherd, was negotiated via Ben Mason at the Conville Walsh Agency for an undisclosed sum. The title will be published as a B-format paperback next April, and will include reading group discussion points. In contrast with the original story, the character Fanny Price is "ambitious, scheming and relentlessly focused", while Mary Crawford "suffers great indignities from her mean neighbour". Shepherd explained: "What intrigues me about Mansfield Park is how unlike Jane Austen it actually is. One of the reasons so many readers are dissatisfied with the novel Austen did write is that they find her heroine at best insipid, and at worst, downright irritating." Simon Petherick, managing director of Beautiful Books, described the book as "fantastic" and "tremendous fun". He added: "The really good thing about it is that linguistically, it's very accurate, and she picks up on all the key themes that appeared in the original . . . But whereas Fanny is quite a pain in the arse in Austen's version, Lynn's Fanny is an outrageous gold-digger." When a murder takes place, mid-way through the story, the novel turns into a "literary version of Agatha Christie." 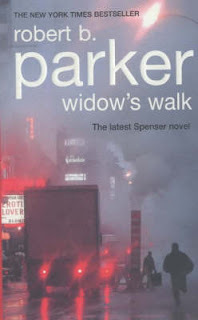 Petherick said: "You cannot work out which character would, or could, commit the murder – everyone who has read it so far has failed to guess who did it." 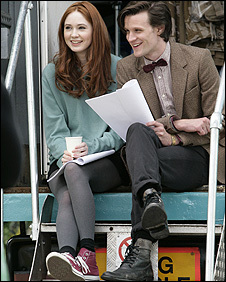 According to the BBC: "The Time Lord's new look consists of tweed jacket, bow tie, rolled up trousers and black boots." Read the rest of the article here. A new competition is running (open to all! ); win a copy of My Last Confession by Helen Fitzgerald. and Terry Halligan reviews the latest in the Turkish Cetim Ikman series from Barbara Nadel - River of the Dead - which is now out in paperback. I'm surprised the whole lot didn't fall out when she jumped in, it's about 5ft high! The army are in Ystad all week for a training exercise, and Wallander is called to the site of a grim and premeditated double murder, with emotional resonance for Kurt. As the murders continue, Wallander and his team investigate deeper and are forced to concede there may be a link with the troops. Episode 3, The Village Idiot, can be watched via iplayer for a few more days. Silence, is a 4 x 60-minute coming of age drama from Company Pictures, which was penned by Fiona Seres. The plot focuses on an 18-year-old deaf girl who unwittingly witnesses a murder and becomes the key witness. There is a new detective on the beat from a writer on Spooks and The Fixer. Luther (working title), will show detective John Luther struggling with his personal demons while attempting to track down a killer each week. In a twist on the traditional format, the killer’s identity will be known to the audience. The 6 x 60-minute series has been written by Neil Cross and will be produced by BBC Drama Productions. Sherlock Holmes will return to the screen in a new 3 x 90-minute series, created by Stephen Moffat and Mark Gattis and made by Hartswood Films. A 5 x 60-minute series called The Deep, set in the Arctic. Written by Simon Donald, it focusses on the crew in an oceanographers submarine far below the ice who become trapped with no power, limited oxygen and no communication after catastrophe strikes. But it soon becomes apparent they are not alone. NB. Neil Cross, author of Burial is behind Luther. Corvus Books has signed a deal for two new books from Michael Ridpath. Nicolas Cheetham bought world English rights from Oliver Munson of Blake Friedmann Literary Agency. The books are part of a new series set in Iceland and the first title will be Fire and Ice. The book introduces Magnus Johnson, a homicide detective who becomes involved in a murder investigation after the body of a university professor is found. Corvus will publish Fire and Ice in spring 2010. Cheetham said: "Fire and Ice opens an ambitious and ingenious crime series, which binds Iceland’s landscape and history, secrets and superstitions in a strikingly original plot that will span several volumes. It is an exercise in storytelling genius from an established international bestseller." The winner of the International Dagger will be announced tomorrow and I'll be monitoring Twitter tomorrow night to hopefully get the results. There is a tie for the book that people *wanted* to win between Stieg Larsson's The Girl Who Played With Fire and Jo Nesbo's The Redeemer - 46 votes (33%) each. But The Girl Who Played With Fire wins outright in the poll for which book people *think* will win with 52 votes (54%) with The Redeemer in second with 26 votes (27%). Last year no-one voted for the eventual winner, but at least this year there are votes for every book in both polls. A new competition is now up and running (open to all! ); win a copy of My Last Confession by Helen Fitzgerald. and Michelle Peckham reviews Fifty Grand by Adrian McKinty. 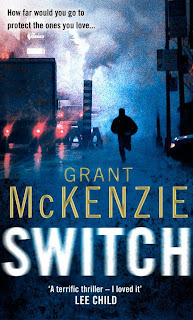 This edition of Widow's Walk came out in 2002, Grant McKenzie's Switch has just been published in the UK. Well one of them might be a raven...certainly a couple seem to be from the corvid family. Hodder & Stoughton has signed a two-book deal with debut thriller writer Charlie Charters, for an undisclosed sum. The first book, entitled Bolt Action, will be published in July next year as a paperback original, with the second - as-yet-untitled- following a year later. Set on a plane - where, since the 9/11 attacks, the door between the cockpit and the cabin must be locked - Bolt Action tells the story of what happens when the pilot and crew have all been poisoned. By chance, a renegade group of British ex-soldiers, fleeing the attentions of MI5, are on board. Hodder described the novel as "the ultimate terrorist spectacular, played out as the world watches, blogs and tweets", which would appeal to fans of Tom Clancy, Jack Higgins, Duncan Falconer, Tom Cain and Andy McNab. BBC4 has just repeated the two episodes of the Swedish version of Wallander that were previously shown last December. 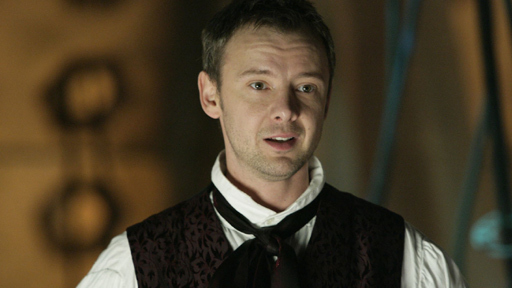 These can still be watched via iplayer for a few more days: Before the Frost and Mastermind. This is listed as episode 3 of 13 so fingers crossed that the rest of the series will be shown. The Village Idiot is repeated on Thursday 16th July at 10.30pm. Old Street Publishing has bought a trio of crime books by South African author Mike Nicol. Managing director Ben Yarde-Buller acquired world English rights from literary agent Tina Betts at Andrew Mann. The first book in the deal will be called Payback and is due to be published in spring 2010. The title will be set in Cape Town at the turn of the 21st Century with two main characters who become embroiled in drugs and violence. The two following books are yet untitled and will be stand alone titles, but will be linked by the same characters. I don't know whether the 'turn of the 21st Century' bit is a misprint as that's quite a futuristic setting. Transworld has signed a deal to publish two new Jack Frost novels, written on behalf of the estate of R. D Wingfield, who died in 2007. Sarah Turner, editorial Director, acquired the UK & Commonwealth rights from Philip Patterson at Marjacq Scripts. Writing under the pseudonym James Henry, the books will be co-authored by James Gurbutt, who has just joined Constable & Robinson to found a new imprint, and Harvill Secker author Henry Sutton. They will be prequels to the bestselling series written by Wingfield, which inspired the series A Touch Of Frost, and the first will be published by Bantam Press in early 2011. The Euro Crime bibliography for R D Wingfield is here. Tom Bale, Stephen Booth, Alison Bruce, Maureen Carter, Clem Chambers, Cassandra Clark, Mary Andrea Clarke, Barbara Cleverly, Nick Connell, Adam Creed, Judith Cutler, R. S. Downie, Nick Drake, Jeremy Duns, Ruth Dudley Edwards, Roger Jon Ellory, Stewart Evans, Jane Finnis, Ariana Franklin, Meg Gardiner, Tony Gheeraert, Dolores Gordon Smith, Ann Granger, Steve Hague, Tarquin Hall, Matt Hilton, Veronica Heley, Kaye C. Hill, Suzette Hill, Seth Hunter, Jim Kelly, Christobel Kent, Deryn Lake, Patrick Lennon, James McCreet, George Mann, Edward Marston, Andrew Martin, Rose Melikan, Janet Neel, Malcolm Pryce, Ann Purser, Mike Ripley, David Roberts, Imogen Robertson, Leigh Russell, Alex Rutherford, E. V. Seymour, Stav Sherez, Harry Sidebottom, Yrsa Sigurdartottir, Roz Southey, Rebecca Tope, L. C. Tyler, Nicola Upson, Dan Waddell, Michael Walters, Paul Waters, John Wilcox and more. There won't be any new reviews this weekend due to the house being in chaos; the gas people are coming tomorrow to begin fitting a new boiler and half my book collection has been packed up and my work desk dismantled so I'm left with a large laptop on my knees in the living room. Not very easy to use (arm already aches from using the mouse on the armrest!) but I'll try and keep up :). I have managed to update the Euro Crime News-page on FriendFeed. Normal service will hopefully resume next weekend though the unpacking might not have finished. I'm using Twitter a bit more (see side-bar) but only at a beginner's level. I haven't listened to it yet so I don't know if anything relevant to Euro Crime is being discussed, but today's Daily Mayo podcast contains an interview with former Spooks star, Rupert Penry Jones. Download or listen at the Radio 5 website. Walking through the woods one warm September day, Reinhardt and Kristine Ris pass a man who is in a state of agitation. Unusually in a small town, he does not return Kristine’s smile and drives off in a hurry. Near the end of their walk they make a terrible discovery: lying in a cluster of trees is the lifeless body of a young boy. It is a moment that will change their lives for ever. Inspector Sejer is called to the scene, but can find no immediate cause of death. As the weeks go by, the appeal for the man seen in the woods to come forward remains unanswered. A once peaceful community is deeply shaken and the children lose the sense of complete freedom they had enjoyed. Then a second boy goes missing.